Juvenile myelomonocytic leukemia (JMML) is a myelodysplastic/myeloproliferative neoplasm (MDS/MPN), which rarely progresses to frank acute myeloid leukemia (AML), yet bears a poor prognosis in infants and children due to potential overwhelming organ infiltration. A number of gene mutations can be responsible for JMML, namely protein tyrosine phosphatase (PTP) and nonreceptor type 11 (PTPN11), which is also associated with Noonan syndrome (NS). Herein, we report a case of an extremely preterm infant with NS and JMML-like picture with a novel germline mutation of PTPN11 presenting as severe, persistent thrombocytopenia, progressive leukocytosis with monocytosis, and hepatosplenomegaly. A male infant was delivered at 27 weeks of gestation for decreased fetal heart rate variability and severe maternal preeclampsia. He required active resuscitation at birth including intubation and chest compressions. Birth weight was 468 g (<5th percentile). His initial physical examination was unremarkable; however, forehead elongation, hypertelorism, and downward-slanting palpebral fissures were later noted. Admission complete blood count with differential demonstrated severe neutropenia (absolute neutrophil count 530/μL, responsive to filgrastim) and thrombocytopenia (48 × 103/μL) which persisted. By day-of-life (DOL) 35, the infant developed abdominal distension and severe feeding intolerance prompting transfer to our quaternary care facility for further evaluation. An exploratory laparotomy was performed; however, only hepatosplenomegaly was noted. Severe anemia and thrombocytopenia [median platelet count of 35; [Figure 1]a continued at our institution requiring multiple transfusions. Leukocyte count varied initially but did not require intervention. Given ongoing hematological anomalies, a bone marrow sample was evaluated but was suboptimal due to hemodilution. Later, flow cytometry on peripheral blood revealed 1.4% myeloblasts (without aberrant immunophenotype) and monocytosis. 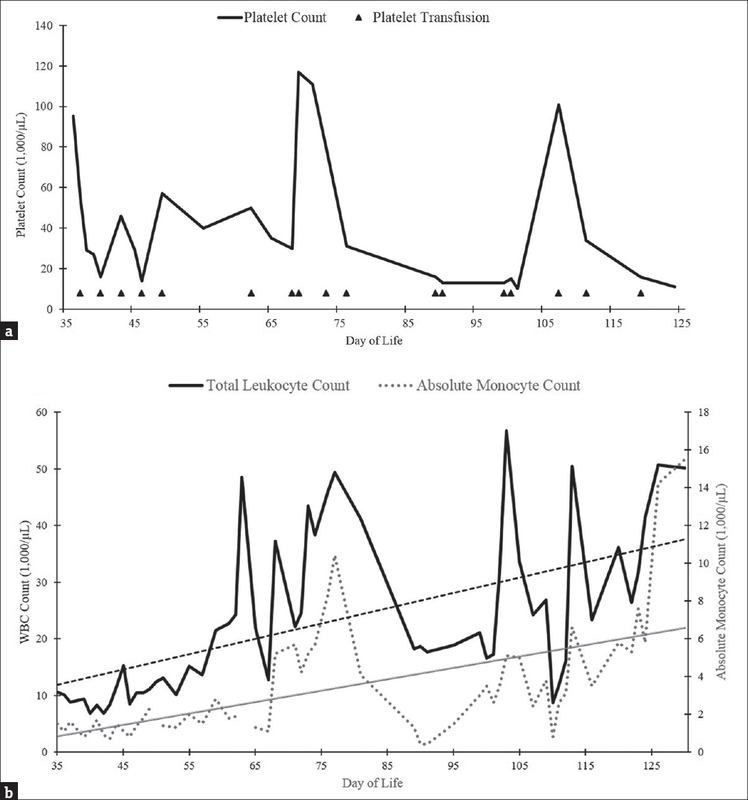 Clinical suspicion for JMML intensified as respiratory deterioration progressed with worsening hepatosplenomegaly and increasing monocytosis [Figure 1]b. A JMML-associated exon panel was performed on buccal swab and peripheral blood samples (University of California San Francisco Molecular Laboratory). Both revealed a missense mutation in the PTPN11 gene (c.794G>A [p. Arg265Gln]). Karyotyping to identify a possible constitutional abnormality was normal. He expired on DOL 133 due to unremitting respiratory failure, and an autopsy was declined. PTPN11, located on the chromosome 12q24.11, encodes nonreceptor PTP SHP-2, which is ubiquitously expressed. SHP-2 is involved in major intracellular signal transduction pathways, and mutations in this phosphatase can affect the control of cell proliferation and organogenesis. Mutations in PTPN11 have been associated with both JMML and NS. Patients with NS can develop JMML (3%) and MPN-like disease (5.6%). 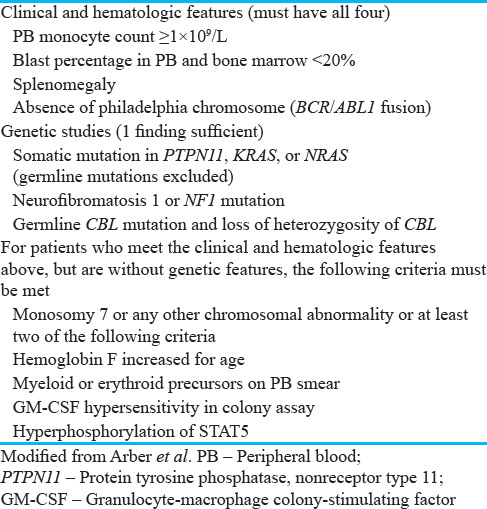 JMML, as defined by the World Health Organization (WHO), is an MDS/MPN that requires clinical and hematologic features for diagnosis as shown in [Table 1]. The WHO diagnostic criteria for JMML specifically exclude germline mutations in PTPN11 as NS patients, who present with a JMML-like picture, may have spontaneous regression. Germline mutations in PTPN11 have been identified in 50% of children with NS, and one-third of the nonsyndromic children with JMML also express somatic mutations in PTPN11. In one cohort of patients, it appeared that some germline PTPN11 mutations (such as p. Asp61His) associated with MPN/JMML take a milder self-limiting course, but up to 60% of patients meeting criteria for JMML had severe neonatal manifestations with 50% dying within the 1st month of life, many from respiratory failure. The link between mutation analysis and clinical manifestation in this cohort varied from other studies, which the authors contributed to a high early lethality. It does not seem possible, therefore, to predict how infants with NS and a JMML-like picture will behave based on the mutation analysis alone. Additional research is greatly needed to help predict the likelihood of JMML progression based on the exact PTPN11 mutation. NS is a relatively common genetic disorder characterized by distinct dysmorphic facial features, stunted growth, cardiac defects, and variable cognitive defects. Our case was unique in its subtle phenotypic findings for NS (mild facial features and no congenital heart defects), but seemingly unrelenting progression of JMML-picture. The previous research has demonstrated that substitutions at codon 265 result in a relatively mild form of NS characterized by more subtle facial features with a lower prevalence of cardiac defects, short stature, and neurocognitive defects. As our missense mutation in the PTPN11 gene has not been previously reported, we hypothesize that this mutation may result in a more aggressive JMML-like picture. The severe progression of lung disease in our case may have been caused by leukemic infiltration, as the lung function worsened with progressive monocytosis [Figure 1]b. Unfortunately, an autopsy was declined, prohibiting evaluation for organ infiltration by leukemic cells. This case raises questions regarding the appropriateness of treating suspected JMML in patients with NS, as many cases may spontaneously regress. Treatment options for bona fide JMML are extremely limited, presenting a unique problem for preterm neonates. Left untreated, JMML can be aggressive and fatal in most cases. Unfortunately, the only curative therapy for JMML is allogeneic hematopoietic stem cell transplantation, which is not a viable option for unstable preterm neonates. Symptoms can be transiently controlled with 6-mercaptopurine (6-MP) or low-dose intravenous cytarabine; however, these are only palliative measures. The risks of bone marrow depression, immunosuppression, and other adverse effects of these therapies should be weighed heavily given the condition, size, and age of the patient. We suggest treatment for patients meeting the diagnostic criteria who are overtly symptomatic (suspected leukemic infiltration) with close monitoring of the potential adverse effects. In summary, we report a case of an extremely low-birth-weight premature infant with the clinical characteristics of JMML associated with NS caused by a novel missense germline mutation in PTPN11. To the best of our knowledge, this is the first reported case of suspected JMML in an extremely low-birth-weight infant and only the third reported in preterm infants., An increased suspicion for myeloid neoplasms in patients with unusual, unremitting hematologic abnormalities may benefit neonatologists and other clinicians who work with preterm neonates. The authors certify that they have obtained all appropriate patient consent. The family has given their consent for clinical information to be reported in the journal. They understand that the patient's name and initials will not be published and due effort will be made to conceal his identity, but anonymity cannot be guaranteed. Ahmad S, Banville D, Zhao Z, Fischer EH, Shen SH. A widely expressed human protein-tyrosine phosphatase containing Src homology 2 domains. Proc Natl Acad Sci U S A 1993;90:2197-201. Strullu M, Caye A, Lachenaud J, Cassinat B, Gazal S, Fenneteau O, et al. Juvenile myelomonocytic leukaemia and noonan syndrome. J Med Genet 2014;51:689-97. O'Halloran K, Ritchey AK, Djokic M, Friehling E. Transient juvenile myelomonocytic leukemia in the setting of PTPN11 mutation and noonan syndrome with secondary development of monosomy 7. Pediatr Blood Cancer 2017;64:e26408. Pannone L, Bocchinfuso G, Flex E, Rossi C, Baldassarre G, Lissewski C, et al. Structural, functional, and clinical characterization of a novel PTPN11 mutation cluster underlying noonan syndrome. Hum Mutat 2017;38:451-9. Locatelli F, Nöllke P, Zecca M, Korthof E, Lanino E, Peters C, et al. Hematopoietic stem cell transplantation (HSCT) in children with juvenile myelomonocytic leukemia (JMML): Results of the EWOG-MDS/EBMT trial. Blood 2005;105:410-9. Sakashita K, Matsuda K, Koike K. Diagnosis and treatment of juvenile myelomonocytic leukemia. Pediatr Int 2016;58:681-90. Yoshida R, Miyata M, Nagai T, Yamazaki T, Ogata T. A 3-bp deletion mutation of PTPN11 in an infant with severe noonan syndrome including hydrops fetalis and juvenile myelomonocytic leukemia. Am J Med Genet A 2004;128A: 63-6. Cheong JL, Moorkamp MH. Respiratory failure, juvenile myelomonocytic leukemia, and neonatal noonan syndrome. J Pediatr Hematol Oncol 2007;29:262-4.